I really need to start a list of places I’ve written up so that I don’t repeat destinations. On the other hand, so long as I don’t say exactly the same thing each time, I suppose that several writeups on the same destinations might be acceptable. It’s not like I am likely to run out of things to say about any given destination. Also, I’m now two months and almost a week out from my trip to Chicago and a return to Northern Illinois Destinations. I had planned to post this on June 2, but it’s been storming lately and I’m old school — I unplug my computer when there’s thunder and lightning. This has cut into my writing time. I’m writing this very early in the morning of June 3, and more rain is expected, but it doesn’t look like it will storm any time soon. I was hoping to find my photos of the San Antonio Museum of Art before now, but I haven’t. Failing that, I was also hoping to make a trip out to the museum to take some new pictures, but that didn’t happen either. So, on to another park (and then to three destinations within the park). That should buy me another couple of weeks before I need to get those pictures. George Washington Brackenridge was a “Yankee” from Indiana who made a fortune, near as I can figure, selling cotton on the black market during the Civil War. After the war finished, Brackenridge moved to Texas. He settled in San Antonio, where he founded the San Antonio National Bank and its sister institution the San Antonio Loan and Trust (I believe that the San Antonio National Bank that existed in the late 20th Century and is now known as Vantage Bank Texas is a different bank). Brackenridge designed the headquarters of the San Antonio National Bank, which still stands on Commerce Street and, at the time I’m writing this, is a law office. I’ve always wondered where the vault was in the bank. Perhaps someday when I’m downtown I will knock on their door and ask. 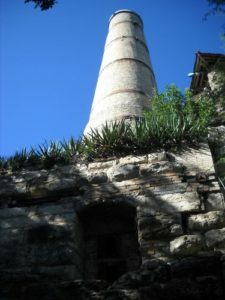 Brackenridge also was involved in the San Antonio Water Works Company, one reservoir of which is now on the property of the San Antonio Botanical Garden. In 1869, Brackenridge bought a house near the headwaters of the San Antonio River and enlarged it into a mansion, which he named Fernridge. He purchased land alongside the river to the south of Fernridge as well, though I’m not sure how much of the land between the two, which is now the campus of the University of the Incarnate Word, Hildebrand Street, and the Miraflores estate, he owned. The land to the south of Hildebrand, which was owned by Brackenridge, was, at first, part of the San Antonio Water Works. Two of the pumphouses still stand in the park today, one is at the northern end of the park and the other is near the clubhouse for the Brackenridge Park Golf Course. The land which is now Brackenridge Park was also the original headquarters of the Alamo Cement Company (which has had several names, including the Alamo Portland and Roman Cement Company). In 1880, two men, William Lloyd and George Kalteyer, realized that the stone near the river was of a quality suitable for making cement. They founded the Alamo Cement Company and set up operations. Some of the buildings of the company, including the kiln, still stand in the park today. The quarries are now the sites of the Japanese Tea Garden and the San Antonio Zoo. The smokestack of the kiln of the Alamo Cement factory. Brackenridge’s original gift to the city was of 199 acres. Brackenridge was fairly progressive for his time, supporting women’s right to vote. Brackenridge did live to see the passage of the Nineteenth Amendment to the United States Constitution, which gave the vote to most American women. There was a hink in that women who married foreign nationals between 1907, when the Expatriation Act, and 1940 lost their citizenship. Some women who married foreign nationals got to retain their citizenship after 1920, when the Cable Act was passed, but the Expatriation Act was not repealed until 1940. There were also practical barriers, such as literacy tests and poll taxes, to voting for immigrant and non-white women in much of the country as late as 1966. But that’s all beyond the scope of this blog post. Brackenridge was also a prohibitionist. The argument went that alcoholism (and alcohol use in general) was hurting the people of the United States, women and children in particular, and so prohibitionists wanted to make alcohol illegal. And they got their way for 13 years. Prohibition didn’t work out. Illegal production and sale of alcohol flourished which just exacerbated the problems that the prohibitionists had wanted to stop. Additionally, since the sale of alcohol was illegal, it wasn’t taxed, which hurt the economy. Since Brackenridge was a prohibitionist, he forbade the drinking of alcohol in the park. In a twist ending, though, Emma Koehler later donated an additional 144 acres to the park. Koehler’s late husband had been owner of the Pearl Brewery. Since Koehler’s money had come from the sale of alcohol, she allowed consumption of alcohol in her gift. This divide is still present today. In the Brackenridge gift, there is no consumption of alcohol, but it is allowed in the Koehler part of the park. Today, Brackenridge Park holds three pavilions, 1.7 miles of walking trails, the San Antonio Zoo, the Japanese Tea Gardens, sports fields, the Sunken Garden Theatre (an outdoor venue for plays, concerts and other kinds of gatherings), a golf course, and the Witte Museum. 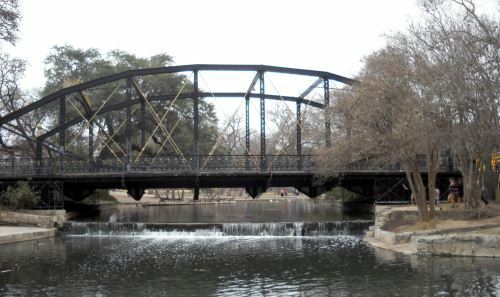 The park also has several interesting bridges across the San Antonio River, including a cement bridge carved to look like wood and an iron bridge which was moved to the park from St. Mary’s Street downtown (see image below). I will be doing writeups on the zoo, the tea gardens, and the museum in future South Texas Destinations postings. The Museum Reach portion of the River Walk goes around the golf course and then through the park. The St. Mary’s Street bridge in Brackenridge Park. I cannot for the life of me remember how I managed to get this angle on the bridge. I think that the river must have bent right there. I do know that I was not standing in the water when I took this. Most of Brackenridge Park is wheelchair accessible. I’ll try to cover specifics as I write up other parts of the park.